Three writers are influencing the way I’m approaching the use of digital tools in relation to writing the traditional research paper for this upcoming semester. 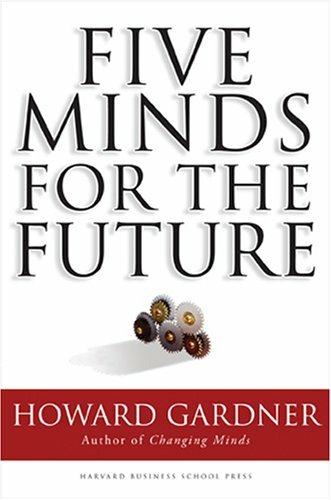 When Howard Gardner outlined the Five Minds for the Future, I nodded in agreement with his call for the ethical mind, yet his description of the synthesis mind and the disciplined mind were the two that struck me most. I’ve been spending more time on synthesis in my teaching lately, not only because it’s a required part of the AP English Language exam, but because it’s a skill that seems to be worth knowing. Similarly the need to develop a disciplined mind becomes more important if you believe warnings of writers like Nicholas Carr. Carr’s book The Shallows had been on my “to read” list for a while. I first took note of Carr’s work (like a lot of other people did) when he wrote “Is Google making us stupid?” At the time, I took exception with his view that the Internet will turn us all into shallow thinkers. Since then I’ve learned more about neuroplasticity and now understand his points better. I still think it’s possible to develop linear, deep-thinking skills today, but it requires some conscious attention. As a classroom teacher who incorporates both digital writing and traditional writing, I’ve been wondering about how my students online writing differs from their paper and pen writing. My gut feeling is the thinking that goes into their digital writing is more connective and shorter, and the thinking that forms their writing on paper is more reflective and longer. I’ll be analyzing this more carefully this semester. I also find there are times when I need to step away from word processing. When I’m blocked on a piece of writing — particularly when I need to do big-picture structural thinking about the shape of a long article — I often reach for a pencil and huge piece of paper, so I can diagram the flow. Clive Thompson, Will the word processor destroy our ability to think? And in a recent column in Wired, he argues that shorter forms like microblogging actually can lead to longer, more in-depth writing and thinking. The torrent of short-form thinking is actually a catalyst for more long-form meditation … One survey found that the most popular blog posts today are the longest ones, 1,600 words on average. Gardner’s ideas of the disciplined and synthesis minds, Carr’s warnings about what the Internet is doing to our brains, and Thompson’s broader view of digital literacy, has me thinking about the role that texting, tweeting and Youth Voices blogging will have in my students' writing as they complete a traditional research paper this quarter. As I have my students work through the Curious Researcher activities during this upcoming semester, I think that these shorter forms might actually lead to better research paper writing.